There are your average, run-of-the-mill serial killers – and then there’s Victor Crowley. A hulking, massive ghoul who relishes in the dismemberment of anyone who wanders into his Louisiana swamp, this cinematic sociopath has been popular with horror devotees since first bursting onto the genre scene in writer/director Adam Green’s 2006 scarefest Hatchet. After discovering her father and brother’s mangled corpses in the original Hatchet, young Marybeth (Danielle Harris) has done all she can to destroy their supernatural killer. Blinded by an unstoppable vengeance that burns inside of her, the young woman’s wild quest for revenge has cost countless lives and now, as Crowley’s swamp is overrun by special forces, the stakes raised to the breaking point. This time, Marybeth will need to find a way to put down Victor Crowley for good – or die trying. Veteran steadicam operator BJ McDonnell makes his directorial debut with Hatchet 3 (or III if you want to be completely accurate), a second sequel to Adam Green's 2006 original that has found some favour in the horror community, with Horror News.net claiming that "Hatchet III wants nothing more than to please fans of the original and in that aspect it succeeds wildly," while a more cautious FEARnet admitting that "at least chapter three treats the fans well and doesn't skimp on the nasty bits." 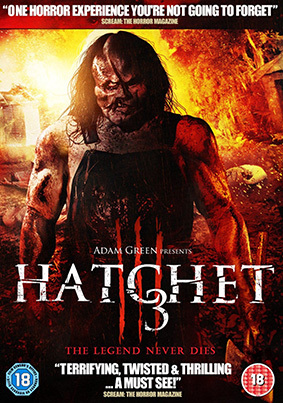 Hatchet 3 will be released on UK DVD on 31st March 2014 by Metrodome Distribution at the RRP of £12.99. No extras have been listed. You surprise me.